Note: This workout was created by SEB Veteran Steve Logan for the SEB Inaugural Workout that took place in Los Angeles at the SEB Headquarters on December 17, 2013. The average time for completion was 20:00. Weight on the Deadlift is up to 225lb., for men and 165lb. for women. Weight on the Shoulder to Overhead and Front Squat is up to 135lb. for men and 95lb. for women. Only one Athlete may work at a time. 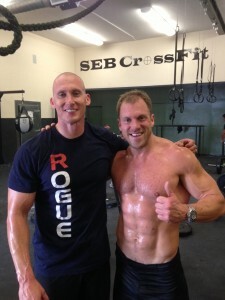 Best Greg Amundson’s and Scott McGee’s time of 16:00 and get a free CrossFit Amundson t-shirt! This will be my last crossfit workout before I leave for winter break. I want that shirt! !